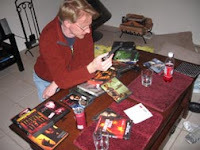 Ohhh, did we have fun at the movie fest I hosted last weekend. 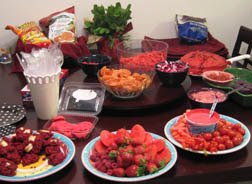 We had an all-red food buffet. Favorites were Sam and Lisa’s cut apples dyed red even on the inside, the “scab” cookies with white chocolate “bones” and the blood-red twinkies brought by Emily. I’m still not sure about that red ranch dip, though. I never thought I’d make it through ten hours of horror movies, but I was ready for more! I’m ready for more marathons, for sure! 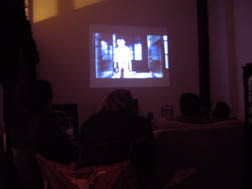 The projector worked out very well, and I love parties! Then Emily has a birthday party for her best friend at 4:30. I also have a shoot at 4:30. 3:15 Wait in car line to snag girls. 3:45 Get Emily dressed in “glamorous gown” for “red carpet” party. 4:10 Wait, wait, wait as long as possible to avoid being too early. 4:15 Run her over to party, just a smidgen before party starts. Thankfully in neighborhood. 4:20 Console crying Eliza who thinks she deserves to go to fancy dress party. 4:25 Skid to a stop before my own house. Pray clients not early. This might be less stressful if I have Emily ride the bus home. Eliza can stay later. Then I can have some room to finish shoot and not worry, Emily get off bus, pick up Eliza, get Emily dressed, drop Emily off at party, and do shoot. No. Not enough time to get Emily dressed. Emily ride bus home. Get her dressed, pick up Eliza at 4. Drive over to party and drop off Emily a bit more early, more time to console upset Eliza, get back at 4:15 and hopefully clients not waiting. Okay. So now I just have to call the school and notify both teachers I’ve changed the way they go home. This is the sort of day I’m having. Don’t get me started about the weekend. It makes this schedule look very very tame. Irma–so sorry I have to miss your party! Sean and Tessa–so sorry I have to miss yours too! It’s not fair, all this stuff happening on top of each other! And a big glass of red wine every day. So, I am a photographer at Christmas. Not all photographers have big holiday rushes–those who focus more on weddings or commercial work or models have a big slowdown. But I photograph kids. So the onslaught begins mid October and is unrelenting until the day I cut them off, which is this weekend. Because I had such a rough Saturday (five shoots, almost all with multiple kids), I pretty much just stopped and left my work to be taken up again on Monday. I answered no emails, returned no calls, and didn’t update anything. 8:30 — Listen to five voicemail messages. Four from the same anxious client not sure when she might ever be able to pick up images. Could I mail them even though she hasn’t paid? 8:35 — Restart 22-hour print job of 250 watercolor cards. 10 hours to go. 8:37 — Open Outlook to find 23 emails, five are new orders. 8:41 — Get interrupted by phone call wanting to redesign cards we made Saturday. Agree to redo them. 8:44 — Begin writing up orders from emails and replying. 8:59 — Phone call from worried client saying husband doesn’t like what they wore in picture, what to do? Promise to crop at shoulders. 9:05 — Back to writing up orders, faster this time. 9:06 — Realize printer silent. WTF! Try to figure out why not printing. 9:09 — Printer pissed about canceling old job on Saturday. Where is work ethic, it asks. I tell it to print or I will toss it out on its ethic. Restart job. 9:11 — Return to writing up orders–even FASTER. 9:14 — Enter orders into Quickbooks. 9:16 — Look over difficult shoot from a few days ago. Try to figure out what to send the lady since she insisted composite images are never believeable and mine would be no exception. But, her kids did not ever stand by each other. Not within five feet, even. Wants card with both kids. Rapidly create new design featuring two separate images. Email it. Hope she approves. 9:28 — Suddenly remember I will not work tomorrow to prepare for photography party. Just promised five clients images will be here by Friday, but not possible unless do all the orders by 2:00 today. Printer senses another work ethic violation and paper jams. 9:30 — Puts head on desk. Rethink whole photography career.